It's funny how easily we overlook many simple things; they're just there, we don't give them a moments thought. Take for example this nut and bolt. Forgetting the discovery of steel, discovery of metal allows, discovery of anti-corrosion - the nut and bolt is really quite a clever team. A quick internet trawl tells me that a Greek mathematician circa 400BC invented the concept of the screw. By 1BC wooden versions were used in oil presses but it wasn't until the 1400's that crude handmade metal screws started appearing en masse in Europe. A Pommie engineer Henry Maudslay patented a screw-cutting lathe in 1797. 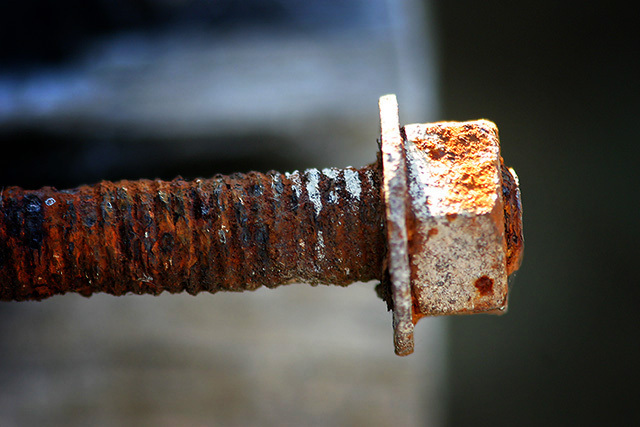 The first bolts were just screws without a taper and a blunt end; the nuts that were produced were tested on bolts until one was found that fitted well - then sold as a matching pair. I bought a box of 1000 zinc coated self tapping self countersinking screws a few weeks ago for $AUD20. Threaded fastener technology has come a long way.